The landscapes of the West, some of them at least, remain powerfully evocative. 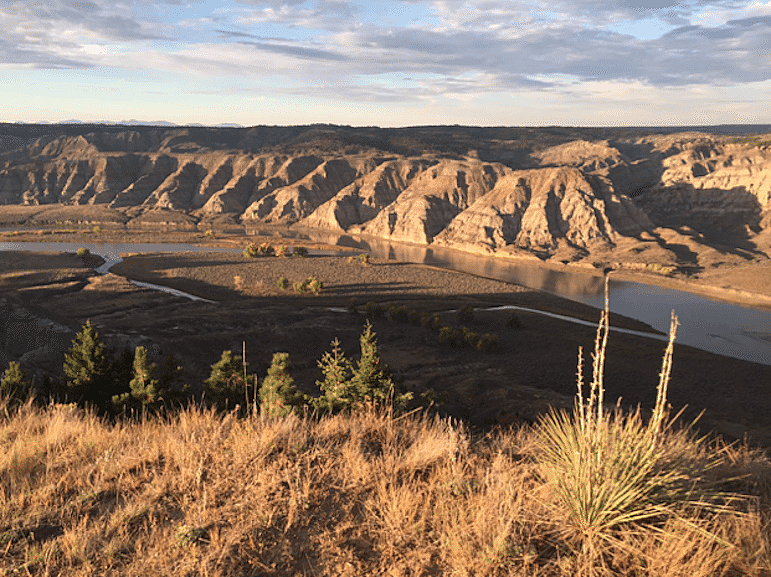 The Upper Missouri River Breaks is one of those landscapes, offering a procession of historical events that capture the imagination. Lewis and Clark slogged through the Breaks on their voyage of discovery, and the setting of the places described in their journals remains intact, barely altered by the passage of more than two centuries. Only a little imagination is required to visualize a steamboat rounding the bend headed for Fort Benton, the innermost port in the world. The steamboats were fueled by wood cut near the river, and even today some of the stumps left behind by the “woodhawks” can be seen in remote corners of the Breaks. I’m drawn to places like this. The wild lands of the West are immensely varied, but one constant is the potential for discovery. Ten years ago, my moment of discovery came in the form of finding an artifact left behind by someone who had traveled along the river long ago. J. B. Lavalle had been here, the artifact proclaimed. We know this because J. B. Lavalle had carefully carved his name into a rock face on a low bluff not far from the river. I found the inscription completely by chance, the result of a simple quest for shade and a perch with a good view of the river. Then I lost it. Not literally, for the inscription remained where it was, but on that first visit I had run out of film and didn’t have a detailed map to record its location. Without documentation, Lavalle’s efforts to preserve his memory remained a secret known, perhaps, only to the two of us. Still, I thought of J. B. occasionally and nurtured a hope that I might find the site again. But life and a nearly 700-mile drive got in the way. Several years went by before I attempted to relocate Lavalle’s inscription. The first attempt was maddeningly futile, the result of impassable roads formed by an interaction of rainfall and clay that creates gumbo slick as ice. A few more years went by and my memory of the location faded further. Yet Lavalle remained in my mind, ultimately inspiring a key character in a novel I was working on, a story set in the region between Fort Benton and the Missouri River Breaks. For this, I felt a debt to the man, a debt I couldn’t postpone repaying much longer. Despite hoping otherwise, I knew I was rapidly approaching a time of life when the window would close on my ability to scramble through rugged and remote terrain on a simple lark. All of this inspired me to make one more attempt. On a glorious day in late September of this year, I looked down from the bluffs to the Missouri River far below, hoping I was somewhere in the right vicinity. Hoping was the operative word, for though I had thought long and hard about where I had been 10 years ago, the memories of that day had turned vague. Hours of poring over images on Google Earth last winter made me believe that I had narrowed the search area. But upon arriving in the Breaks, I couldn’t even be sure where to begin. Worse yet, the place I thought looked most promising from an armchair reconnaissance turned out to be all wrong. Nothing looked familiar and the huge area below seemed to lack the right combination of accessible rock faces and trees, one of the few things I remembered from a day that now seemed even longer ago. As a dreaded sense of futility began to settle in, another memory kicked in. Ten years ago, I had driven the rental car only as far as I dared over an increasingly rough road. With this insight, I drove back along the road several miles, stopping at a point where descending a steep grade brought an open view to the river. It seemed like a good place to start. My joy was similarly “counterbalanced” that day. A joy at simply being in the Breaks on a beautiful day had emerged, enhanced by a view with a glimmer of familiarity and the thought that several promising areas to explore lay before me. A stronger sentiment, however, was a lingering sense that no one could ever find such a small, inconspicuous object amid the complex landscape between where I stood and the river, some 700 vertical feet below. As I scanned the landscape with binoculars, another insight came. There were lots of places where a man might carve his name, but why would J. B. have traveled farther uphill than he had to? I decided to make a direct descent towards the river. One landform looked promising, but it still required a series of drops and ascents as I attempted to stay as close to the rock face as possible. As my legs began to tire out, there it was, something that couldn’t be seen in the landscape unless a person was standing right next to it. Upon this rediscovery, I shouted Lavalle’s name aloud, not expecting a response but also not knowing how else to celebrate the occasion. Though I often wish otherwise, I’ve learned that the past has no voice of its own. But there are places where time seems compressed and the distance separating the past from the present becomes not so great. The Missouri River Breaks is one of those places. Before facing the long climb back up to the rim, I lingered at the site and studied the inscription more closely. Whether simply tiring of his task or facing some urgency, it was obvious that Lavalle had hurriedly finished the inscription, the depth of his lettering trailing off towards the end. After returning home, I confirmed with Bureau of Land Management and the Montana State Historical Preservation Office that J.B. Lavalle’s inscription had not been previously recorded. Further, no one by that name is known to have settled in the surrounding area. People involved in the fur trade, however, had long used the Missouri River as a vital travel route and it was dominated by men with French surnames. Lavalle is a fairly common name among them, including a record from the mid 1840s that lists a man named Joseph Lavalle on the payroll of Pierre Chouteau Jr.’s American Fur Company, a company known to have operated along the upper Missouri River in what is now Montana. Of course, there are other possibilities. Perhaps a document yet to be found will reveal who J. B. Lavalle was and what brought him to carve his name on an unremarkable rock face hidden deep in the Missouri River Breaks. Until that happens, I’ll nurture an image of a man quietly celebrating a voyage so far upriver, determined to leave a legacy of his passage while wondering if anyone would ever notice his work. When his companions shouted that it was time to return to the boats, Lavalle hastily completed the inscription. It took well over a century, but we’ve finally noticed. Tom Keith is a principal in a planning and design firm and lives in Fort Collins, Colo. His interest in the Missouri River Breaks region was inspired by events in the life of his great-grandfather, Mell Keith, who arrived in Fort Benton in 1881. Tom is the author of “When Everything Changed, a Story of Montana Territory,” a novel that will be published in 2017. This article first appeared on Last Best News.